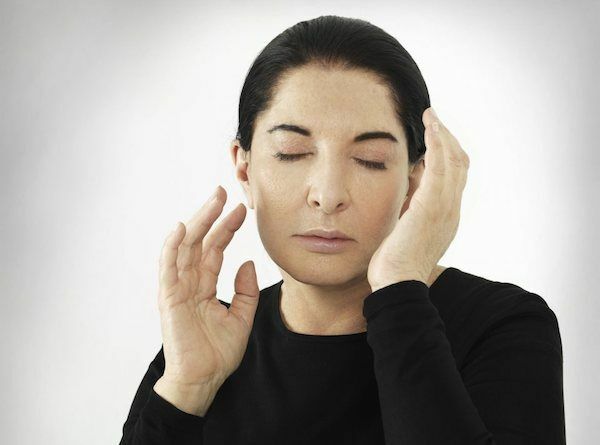 On Thursday, October 23, Marina Abramovic opens her first performance piece in a gallery since 2002. The opening is from 6 to 8 p.m. at Sean Kelly Gallery (475 Tenth Avenue) and the work, "Generator," will focus on "nothingness." Visitors will be asked to leave their cellphones, watches etc.-- you can keep your clothes -- in a locker before they enter the empty space, and then will wear blindfolds and noise-canceling headphones. Only 68 people will be allowed in at one time, so be prepared to wait in line. The installation will be up until December 6. The same night, Sean Kelly also opens a show of new photos, sculpture and works on paper by Jose Davila. 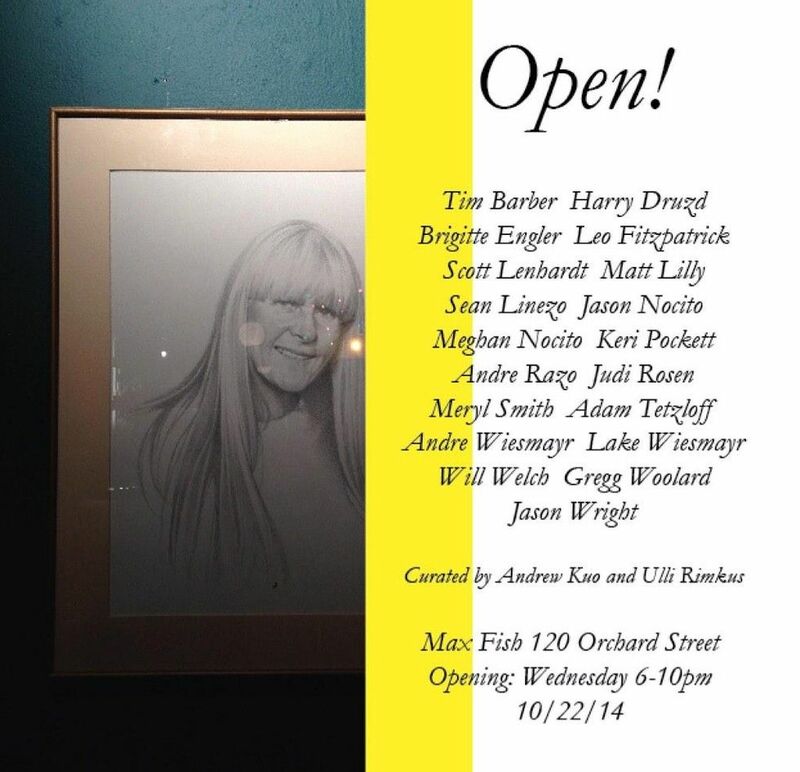 The all-new (and still fabulous) Max Fish (120 Orchard Street) gets back in their art groove with a big group show called "Open!" curated by Andrew Kuo and Ulli Rimkus. The opening is Wednesday, October 22, 6 to 10 p.m. Lots of familiar names on the list of partipants: Tim Barber, Brigitte Engler, Leo Fitzpatrick, Andre Razo, Greg Woolard, Harry Druzd and more. Emmanuel Fremin Gallery (547 West 27th Street, #510) hosts the opening reception for a show of photos by the recording artist Moby on October 23rd, 6 to 9 p.m. 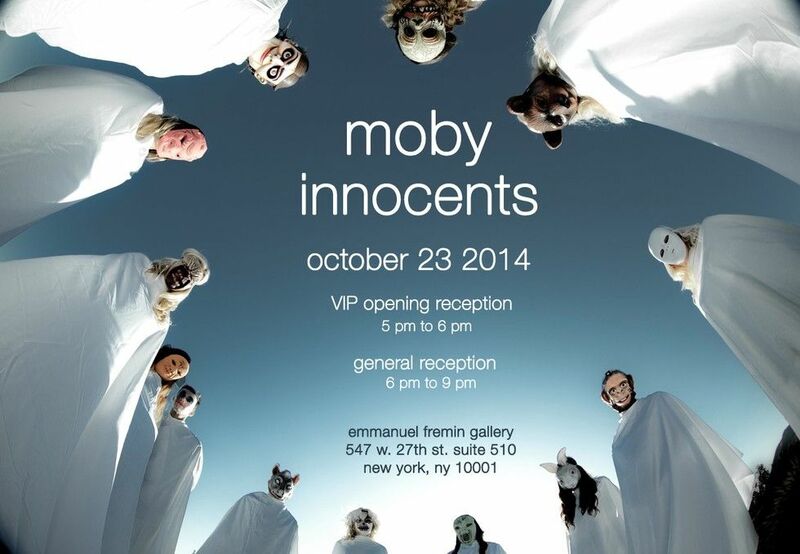 This show, "innocents," is Moby's third "body of photography" following "Destroyed" and "Crowds." It's up until the end of December and it (or a variation) was previously shown in L.A. in the spring of 2014. 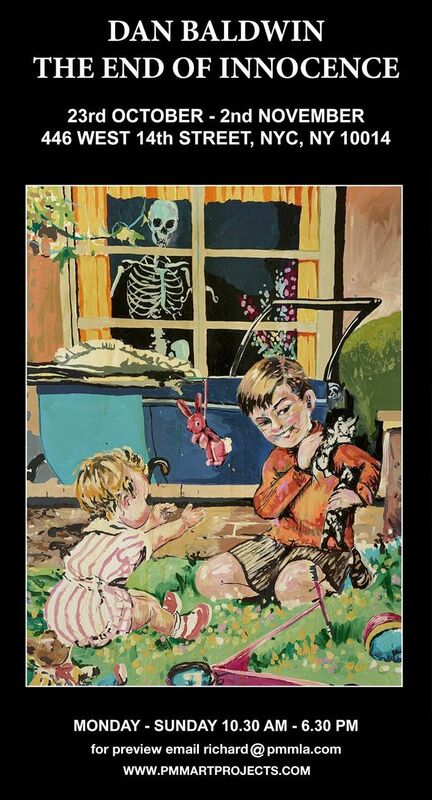 Dan Baldwin's "The End of Innocence" opens on October 23rd, 6:30 to 10:00 p.m., and runs until November 2nd in a pop-up space under the High Line at 446 West 14th Street. This is the first solo exhibit in New York by Baldwin, who lives and works in London. The show was put together by two music biz execs, Pat Magnarella and Roger Klein, via their PMM Art Projects endeavor. Visionaire launches their latest "Art" issue in honor of John Baldessari with a week-long interactive art installation in the lobby of the Chrysler Building (405 Lexington Avenue) from October 23rd to the 28th.The show is a partnership with Samsung and a celebration of the "current ease of digital and emailable self-portraits with the time-honored craftsmanship of printmaking." Contributors to the group show include: James Franco, Miley Cyrus, Pedro Almodovar, Drew Barrymore, Drake, John Waters, Ai Weiwei, Kaws and Michael Stipe. 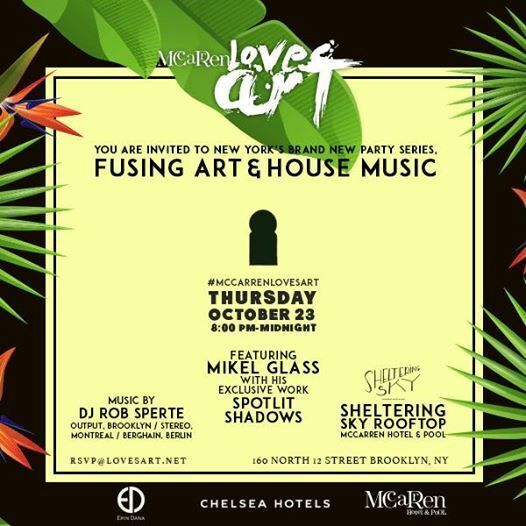 launched a new event called "McCarren Loves Art" earlier in the year, and the next in the series is Thursday, October 23rd, from 8 to midnight in their rooftop lounge. This week's party will be designed by Mikel Glass and will feature performance artists Gage Kass and Ellen Turietta and video director Kurt Ritta. 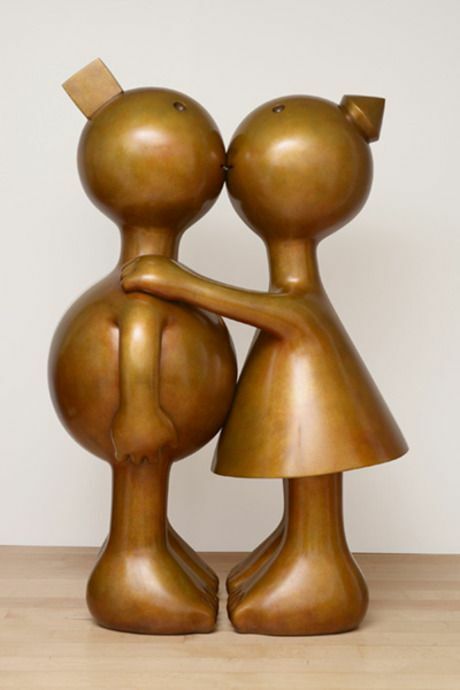 A new show of recent works by Tom Otterness opens on Wednesday, October 22, 6 to 8 p.m., at the uptown Marlborough Gallery (40 West 57th Street). Called "Creation Myth," () the exhibit includes over 20 sculptures made of stainless steel, limestone, bronze and marble; with the works alluding to Ovid's "Metamorphoses" -- but with a twist. 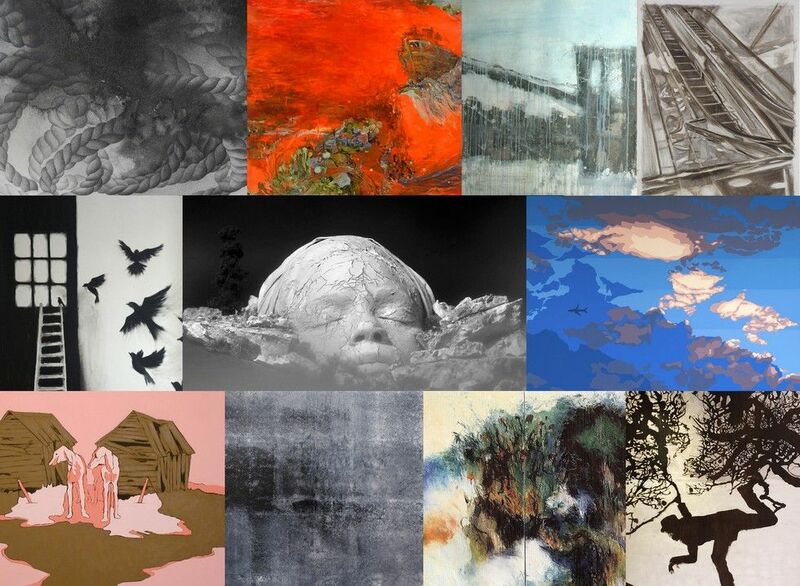 Chashama, the NYC non-profit that supports visual artists, is having a "Studio Artists Reception" curated by Katie Fischer on Wednesday, October 22, 6 to 8 p.m. in the lobby gallery of the Conde Nast Building (4 Times Square). The show features works by 16 artists including Lindsey Warren, Elizabeth Allison, Tara Parsons, Sung Min Lee, Asia Ingalls and more. It's up until November 3rd. Chashama has been supporting the arts since 1995 with a primary goal of utilizing empty real estate for artists' studios and spaces for exhibitions. If you're still heading out to the Hamptons on the weekend, stop by the Parrish Art Museum on Sunday, October 26, for two openings: "Mary Queen of the Universe" featuring new sculpture by Steven and William Ladd; and "In Motion" with sculpture and installations by Alan Shields, including a dance performance by Stephen Petronio Company. If you're up near Lincoln Center, be sure to check out the the giant LED screen in the middle of the plaza. It's an installation by the Irish artist John Gerrard called "Solar Reserve" that changes in real time throughout the day and re-creates a solar power plant in Nevada. On view until December 1st.